Lively. Clever. Good with kids. And lucky to be alive. Martin is such a wonderful dog. It's hard to believe he was almost put down. Martin, the handsome young Springer Spaniel whose pictures you see here, is bright, affectionate, full of fun and loves to be snuggled. He gets along well with adults, children and other dogs. He even likes cats! Yet despite his film-star looks, charming personality and robust good health, Martin was very nearly put to sleep. 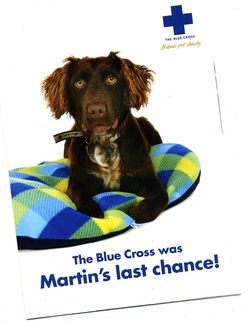 If he had not been rescued and brought to The Blue Cross, Martin, like thousands of dogs across the British Isles, would most certainly have been destroyed. You see, Martin was a stray. He was found wandering alone in the country and brought to a local pound which, like so many pounds these days, simply didn't have the staff or resources to re-home him. The pound was only able to keep him for seven days. If no one came in and adopted him before that, well ... it just doesn't bear thinking about. There are many more vulnerable dogs like Martin. In fact, according to the BBC news, over 20 stray dogs die every single day just for want of a home. That's nearly 150 dogs put down every week! Will you help The Blue Cross save dogs like Martin? Every year, The Blue Cross re-homes nearly 6,000 unwanted and homeless animals. We never, ever, put down a dog that's healthy and has a chance at finding a loving, caring home. Take Georgie, for example — you'll see his picture in the enclosed leaflet (he's a cutie). A poorly healed broken front leg has left him with a limp. Georgie also has a condition known as shallow hips, which means he's likely to develop arthritis in later years. Many would give up on Georgie, but not The Blue Cross. With plenty of veterinary care (including a very expensive set of x-rays), medication and special treatment, he's coming along nicely. A few families have already shown an interest in Georgie and, by the time you read this letter, we may already have found him a home. But if not, The Blue Cross will continue to give Georgie care, affection and security for as long as it takes until the right loving home can be found. Martin and Georgie are safe now. But there are many more dogs to be protected. That's why I'm writing to urgently ask that you make a donation today to help save vulnerable dogs from being put down. Please do whatever you can to help support our campaign to care for and re-home these innocent animals — animals whose only crime is being homeless. Fill in the donation form and get it in the post as quickly as you possibly can. On behalf of defenceless dogs everywhere, please accept my sincere thanks in advance. P.S. : Martin was a lucky dog, but many others are not so fortunate. Please act now to help protect dogs at risk. "Will you help save innocent dogs like me from being put to sleep?" Yes, I will help save innocent dogs like Martin from being put to sleep. A big THANK YOU from Martin and his pals! When Martin came to The Blue Cross adoption centre at Tiveton all he needed was a good clean-up and a decent meal. Aside from that, he was a perfectly healthy, happy, lively dog with a bubbly, outgoing nature. How sad to think that Martin and hundreds of dogs like him, could be at risk of being put down — simply because they have no home. Open this leaflet to meet some of the wonderful dogs The Blue Cross is working hard to re-home. And please use the donation form to save other dogs like them from being put to sleep. Martin and his friends are safe now. But for hundreds of other dogs, time is running out. We'd like you to meet some of the wonderful dogs who have been rescued from being put down and are now waiting to be adopted. As you can see, each dog is special. Each has his or her own, unique personality. But, sadly, these are the lucky dogs. For every bright, happy dog you see here, many more are in grave danger. Please act now to help The Blue Cross find loving, nurturing homes for dogs like these. It's hard work and, like so many things these days, seems to cost an awful lot of money. But, with continuing support from pet lovers like you, The Blue Cross will never give up on these animals. There's a donation form in the envelope with this leaflet. Please, complete it today and drop it in the very next post. Rob, a 5-year-old Jack Russell Terrier, is a shy fellow who's very particular about who he lets take him for walkies. Labrador retriever cross Beth is a typical puppy. She loves to play "fetch" and is great with kids and other animals. The Blue Cross has already found her a new home. 18-month-old Amber is a shy Border Collie. But she gets on very well with older children and other dogs. Domino is a working Border Collie. Just one year old, he's very active, alert and always ready for action. We don't know how old Labrador/Staffie mix Maddie is, probably about 3 or 4. She's a lovely, big soft dog with a sweet nature. Roger, a 10-month-old Lurcher cross, is all legs. He never seems to stop running around and will play with anything he can get his paws on. Kai is a soft-hearted, sociable chap who sometimes forgets that he's not actually a lap dog. A mix of Husky and German Shepherd, Sasha will need a little more behaviour training before being adopted. But she's got great potential. Ben is a typical Collie. he likes to herd and is inquisitive and intelligent. Shep is a friendly, excitable Border Collie. Just 18 months old, he loves playing with toys and meeting new people. Georgie walks with a limp and suffers from "shallow hips." But that doesn't hold back this fun-loving black Lurcher. Lilly, a calm and gentle 2-year-old Brindle already has a new home to go to. With her relaxed personality, she'll be the perfect companion for a young boy with cerebral palsy. Will you help The Blue Cross rescue other dogs like these? The Blue Cross receives no funding at all from the government and relies entirely on donations from concerned animal lovers to protect and care for pets in need. Please contribute whatever you can to help continue this important work.